Added by Bill Bowman on April 30, 2018. The Township Council voted to purchase a variety of goods and services during its two April meetings. Awarded a $418,566 contract for the resurfacing of Woodlawn Road to Meci Inc of Clarksburg. Awarded a $32,000 contract for a “Community Forestry Hazardous Tree Assessment/Survey” to CME Associates of Parlin. 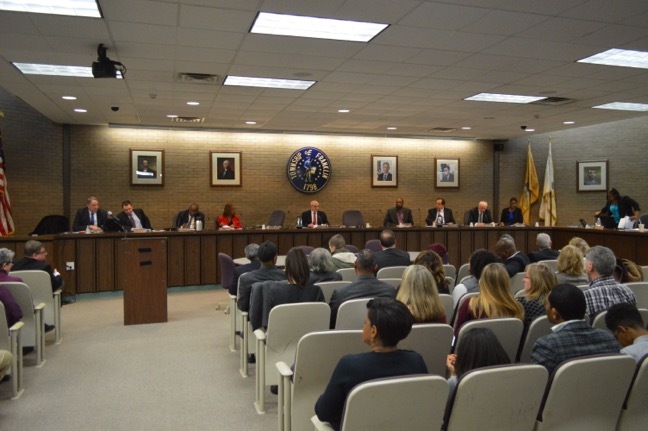 Adopted on final reading new salary ranges for township white-collar employees as follows: Level A, from the previous range of $46,215.20 to $69,322.80 to the new range of $49,999.99 to $90,000. Level B, from the previous range of $32,000 to $62,000 to the current range of $49,999 to $70,000. Level C, from the previous range of $28,956 to $48,875.50 to the current range of $39,999.99 to $60,000. $395,500 for the purchase of five marked interceptor sport utility vehicles, one marked expedition, emergency lighting and equipment for new vehicles, GRIP Idle Management System and OEM trailer for the Police Department. $155,000 for the purchase of a mason dump truck with plow, pickup truck with plow and trailer for new loader for the Department of Public Works. $365,700 for the purchase of Panasonic toughbooks, portable radios and mobile radios for the Police Department. Adopted on final reading an ordinance appropriating $961,500 from the township capital fund for various items for the township sewerage authority. Approved on second reading a bond ordinance appropriating $1,020,000 for annual water main replacement, cleaning and lining. $1,395,000 for improvements to Castleton, Consovoy, Middlebush and Naaman Williams parks, replacement of bike paths at JFK Lienar Park, the purchase of 10 big belly trash enclosures, a landscape trailer, two bobcat lawn mowers, and sand pro ball field grooming attachments, and miscellaneous improvements. $46,000 for the replacement of the furnace and air-conditioning system at Van Liew Historic House and painting of Wyckoff Historic House. Awarded a two-year, $200,000 contract to Maaco Collision of North Brunswick for motor vehicle body repair and refinishing. Awarded a $250,000 contract for the purchase of water meters from Core and Main of Edison. Awarded a $309,785 contract for the Mattawang Drive area resurfacing program to CCM Contracting of Green Brook. Awarded one-year contracts worth $30,000 each for open space appraisal services to Sterling DiSanto of Somerville, Sholk Real Estate Appraisal & Consultation of East Brunswick, and Tom Rodriguez Associates of Stockton. Awarded a $15,000 contract for township code publishing to General Code Publishers of Rochester, N.Y.
Approved a $30,000 increase to the $300,000 contract for legal services to the Iselin law firm of township attorney Louis Rainone.